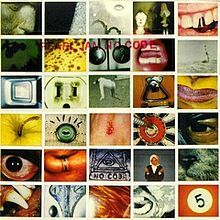 This song was performed by Pearl Jam (Eddie Vedder, Jeff Ament, Stone Gossard, Mike McCready, Jack Irons) on their 4th studio release “No Code″ in 1996. The album was produced by Brendan O’Brien (with Pearl Jam), mixed by Brendan O’Brien and Nick DiDia, and engineered by Nick DiDia. I highly recommend reading this article while listening to your copy of the song, then watching the video on the bottom where I play the bass part with ultimate attention to the nuances of timing, articulation and dynamics in Jeff Ament’s performance. The intro kicks in full power, in a way that you can’t ignore. One more thing that adds to the surprise and to the feel of momentary disorientation (other than it sequenced after the much softer and mellower “Sometimes” on the album), is that all instruments play the first note starting on the last 1/8th of the bar before the first one. All other chord changes in the intro are syncopated as well, creating a unique drive to the intro. On the very first note, there are two added guitars (one on each side of the stereo image) playing the first D chord on a higher voicing and stop on the first chord change. These guitars are a little brighter and louder than the basic tracked guitars, and add a serious kick to the beginning of the song. They add to the overwhelming and uplifting feel at the very first moment the song begins. They also play on the beginning of the second repeat of the intro (but not on the choruses). The guitars are heavily distorted, and sound pretty dark and dry with good body. They appear to be the closest element in the mix. They are played aggressively with biting quality. The left guitar sounds slightly brighter than the right guitar. The Hi-hat is adding to the drive, playing the 1/8th notes in an ever developing pattern, with different accent, articulation and dynamics on each hit. The kick sounds dry, with not a lot of tone and ring. It has a good punch that comes from the high bass region, but not a lot of low mid body and resonance. It has a good attack which is focused on the hi-mid to high frequency region, and appears in the center of the stereo image. The snare is played aggressively with rim shot. It is tuned to a relatively high pitch, with a somewhat accentuated low mid resonance. It sounds relatively thin but has a good attack and is cutting through the mix. It has a very short ringing to it and sounds a little bit unfocused, as if it is coming more from the overhead and room mics than from the close snare mic, but appears in the center of the stereo image. The Hi-hat is the brightest sounding element in the mix, and has good sizzle. It doesn’t have a lot of body to it, but doesn’t sound too thin either. It appears towards the right side of but is spread well across the stereo image, I assume because of the overhead and room mics. The overheads appear to be spread to the extreme left and right. The crash cymbal that is played in the beginning of and in the middle of the verse appear on the extreme right, but the crash/ride that is played at the end of the second chorus and on the last chorus appears to be spread more towards the center. The cymbals sound pretty dark but have good definition and no muddiness. The bass sounds dark and overdriven, with good low mid growl. Notice that on the last 2 bars of the intro and in several points over the song, a brighter, hi-mid oriented overdriven bass track (of the same performance) cuts through over the dark sounding bass track, adding to the aggression and movement of the bass sound. It might be as a result of manually riding the overdrive bass track or as a result of playing dynamics. Notice that not all the bars here are 4/4. Bar 4 for example is a 2/4 bar, as well as bar 9, causing an asymmetrical number of bars in the intro. If we consider each 2/4 bar as half measure in length, it would make 10 bars in overall length of the intro. “Is there room enough for both of us? The Hi-hat moves from 1/8th notes to 1/4 notes, as the pedal goes from slightly open to fully closed each time, making it 1/8th note in length, followed by an 1/8th note rest. The bass plays an 1/8th note rest at the beginning of the first bar, as well as the beginning of each other bar in the verse. The left guitar plays a half note length chord at the beginning of the first bar and each other bar (where the bass rests), but then starts playing muted 1/8th notes, while the right guitar plays open 1/8th note chords. The tighter playing changes the texture from the intro and makes way for the lead vocals that are introduced here. The lead vocals sound bright with good hi-mid content, but they are distant, in their own space in the mix. They seem to have a very short mono slap delay and short reverb with short if any pre delay mixed in a way that they are not obvious, but certainly pushing the vocals backwards in the mix. At the second repeat of the verse, the left guitar plays an even longer 2 bar chord at the beginning of the 10th bar, and then muted 1/8th with more aggression and attitude a little ahead of the beat. The end of the verse ends with an aggressive upward bend on the left guitar on the last dotted 1/4 note. Notice that here also, there are a few bars that are 2/4 in length, with the total number of them asymmetric on each half of the verse. Also notice that most bars start on the last 1/8th of the former bar. I refer this subdivision to be the beginning of the bar for convenience reasons. “If you’re the only one, will I never be enough? The chorus is basically like the intro, except that the lead vocals are also there, and the Hi-hat plays with the pedal a little more open than in the intro. The high voicing D chord guitars that were on the beginning of the first bar and on the second repeat in the intro are not added here. On the left side, another guitar is added. It is doubling the basic tracked guitar, until it plays a high register sliding chord on the last bar of the first half, and abruptly cut at the end of the second bar of the second repeat. This chorus is a repetition of the first chorus. A new chord progression is introduced. Notice the counter movement between the bass and the guitars on the second chord (and each time this change occurs). The guitars emphasize the major 3rd note of the chord going down from D to C#, while the bass emphasizes the 5th note of the chord going up from D to E, essentially making it a 2nd inversion chord. A new guitar part is introduced on the right. It plays an interesting movement of high register notes ringing together with a major 2nd interval between them. It makes more sense when all instruments start playing a constant G chord on the 9th bar (notice that the 8th bar is a 2/4 length), preparing for the bridge. When start playing the G chord, the drums start riding the crash cymbal with accented 1/4 notes, while the basic tracked right guitar gradually fades out, leaving the high register new part. The vocals get louder and closer in the mix, while all its reverb and slap delay are cut. Notice that the guitars are now emphasizing the high register movement that was introduced before, staying on the same chord, while the bass is playing a melodic movement on a higher octave, essentially creating a new harmonic progression. This melodic movement on the bass supports the melody of the vocals rhythmically while creating a melodic counter movement against it. The drums keep riding the crash cymbal like before, but with a lighter touch. The buildup to the last chorus begins when the vocals of the bridge end. First the left guitar starts playing aggressive open chords. The bass starts playing counter movement progression making 2nd inversion chords. All instruments start playing louder and stronger, with the last 2 bars of the bridge being the loudest, as the basic tracked right guitar is coming back with ultimate aggression, leading to the last chorus. All instruments play with more attitude, as the drums start riding 1/8th notes with accentuated 1/4 notes on the crash/ride bell. The lead vocals move backwards in the mix. The bright overdriven bass track is most prominent here, and is easiest to pick up on the melodic bass movement on bar 7 of this chorus. The same chord progression of the instrumental is introduced again, while the lead vocals sing the lyrics of the outro. On the 5th bar of the outro, the high register guitar part is introduced on the right again. The vocals sing a long sustaining note, which shifts to falsetto on the high register in the middle, while all instruments stay on the G chord. The drums are riding the crash again. All instruments start playing softer and softer while the high register guitar part stays until the end. The vocals are singing a staccato rhythmic “ch” sound, emphasizing the 2nd and 4th beats along with the snare until eventually they stop. After all instruments have stopped, the high register guitar part keeps playing two more bars until the end.